← A Harmony for Steve is Available Today! Gregg and I just returned from a week in Maui. We had a terrific time. 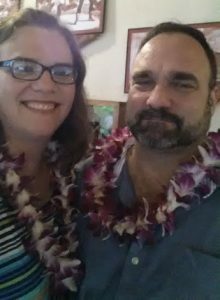 We attended a luau, toured a sugar plantation museum, visited Oahu and Pear Harbor, walked along the shore and let the warm waters of the Pacific lap our feet, and ate some really amazing food. As we were shopping for souvenirs for our kids, I came across a really cool coffee cup and thought about you – my readers. You can enter to win this coffee cup, 7 ounces of Hawaiian coffee, and your choice of one of my paperback books (any paperback you want). To enter, check out all of the options in the Rafflecopter below. The only mandatory entries are that you tell me, in the comments, your favorite vacation spot, and that you sign up to receive my newsletter. Have fun and good luck! This contest is open to anyone who lives where it’s legal to ship coffee. 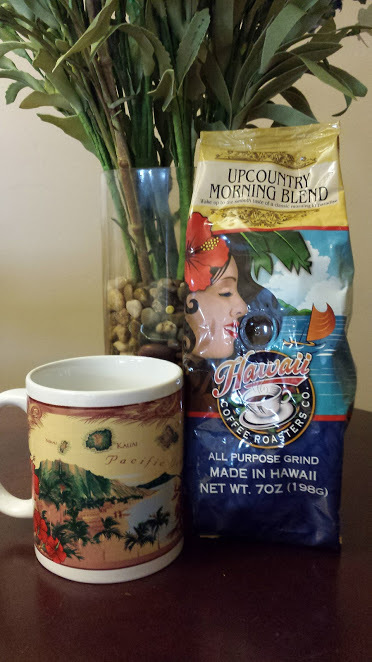 This entry was posted in Blog, Giveaways and tagged coffee, giveaway, hawaii. Bookmark the permalink. 32 Responses to Hawaiian Coffee Giveaway! My favorite vacation is a family cruise to anywhere! I have always wanted to go to Hawaii. I am glad that you were able to go. I would love to visit Hawaii some day! I love to go to Panama City Beach in Florida!! What a fantastic beach. My favorite vacation getaway is Tombstone,AZ for the ambience and friends. we love hawaii. it is where my honey & i met in 1968 as freshmen at a small private school in honolulu. our dads were stationed at nas barber’s pt over by ewa & ewa beach on oahu. we only get back there for our high school reunions every ten years but it is still one of our favorite places to visit plus with good friends from school. I love to go to Trinidad. It is one of the most beautiful islands in the Caribbean. It also helps that I have family there. Favorite vacation spot, hmmm. I love camping in Glacier! I Am really looking forward to a pacific themed book set in 2018!! My favorite place is Yosemite. We just got back yesterday and I already want to go back. It’s my happy place.